Our initial introduction into the dog world came when we attended dog obedience classes in 1983 at the local park. From that point in time, we've been privileged to share our lives with several breeds of dogs. Part of our family now are Golden Retrievers and Tibetan Terriers. Over the years we've been involved in Obedience Clubs, holding various Committee positions. In 1991, I became a Life Member of Murrumba Dog Obedience Club, now known as Caboolture Sports Dog Obedience Club. We are founding members of Pine Rivers Dog Training Club. Thanks to its dedicated members, the Club has become a prominent positive training Organisation on the north side of Brisbane. In 1997 I was accepted as an Obedience Trainee Judge, and over the next few years, I attained my Judges license thus allowing me to judge from CCD (Community Companion Dog) through to UDX (Utility Dog Excellent). In 2008, I was elevated to judge Endurance Tests and in 2009 I attained my DWD (Dances with Dogs) Judges license. We moved from the hustle and bustle of city life, to Nanango in 2003. Nanango is a quiet little country town in a rural area outside of Kingaroy (the peanut capital) in the South Burnett. While on holiday in Tasmania in 2003, I visited Hobart Dog Obedience Club. This is where I saw my very first Tibetan Terrier. 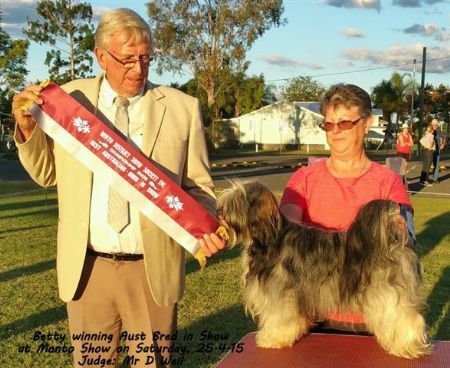 His name was Trevor and was bred by Chris and Gordon Lawrence of Bakit Kennels in Rockhampton. Monte (Ch Bakit Ang Ki Chi ET) came to live with us in November 2005 and his personality is true to the characteristics of the Tibetan Terrier breed. In 2008, Pheebe (Ch Bakit Cunwa Po Nya) joined us and now "Hugin" (Ch Kyang's Em'a El-Hu-Gin (Imp Sweden) and Siddartha Mint Edition (Imp Ire) have arrived to add new bloodlines to the breeding program. Hugin and Wizard are in partnership between us and the Lawrences' of Bakit Kennels. Also not to leave out Effie (Bakit Fee Ona), a lively girl...progeny of "Bradd" (Supreme Grand Ch. Alilah Bradd (Imp UK) and "Shelby" (Ch Allegro Bakit Shelbyrite (Imp NZ). A very promising Dances with Dogs starrrrrr !!! A new girl, Hugins' daughter, Santi (Ch Bakit Hasanti) has joined our merry gang of TTs. She is a confident and up front girl, loves to show off at any given moment. A couple of new additions have joined our crew and they show great promise for the future. Being new to the Tibetan Terrier breed and with the guided assistance of Gordon Lawrence (Bakit Kennels) and Marion Rogers, past exhibitor & owner of many TT's since 1994, our aim is to breed healthy and happy dogs in a loving environment. We firmly believe in quality not quantity and all our dogs are tested for hip dysplasia, PLL, PRA3, rcd4, and NCL. Thank you for looking at our site and Oh! I forgot to mention that all our dogs live inside with us and sometimes you have to be really quick to find a spot on the couch !! !